Cool FM radio presenter Paulo Ross is well known for his love of mountain walking — and for deeply personal reasons he’s passionate about the health benefits it brings. As he heralds the launch of the Mourne International Walking Festival this month, the 28-year-old Co Down native talks to Stephanie Bell. He is affectionately known to his radio audience as ‘Mourne Man’, but behind the banter is a heartbreaking story about why Cool FM’s Paulo Ross has become passionate about walking Northern Ireland’s biggest mountain range. Paulo is delighted to be asked to serve as an ambassador for this year’s Mourne International Walking Festival and is particularly keen to promote the mental health benefits of hill climbing. “Whatever I have going on in my head I leave at the bottom of the mountain for three or four hours. I go up the mountain and forget about it and pick it up later it,” he says. Paulo (28), originally from Ardglass, now lives in Belfast and is part of the Cool FM breakfast team along with Pete Snodden and Rebecca McKinney. He and his family have been through a tough few years after his mum suddenly became ill with severe mental health problems. Her illness saw her go from an outgoing, active woman who loved sport to self-harming and trying to take her own life. It has been a tremendously difficult few years for Paulo, his brother and father, who at times felt helpless as they tried to get his mum the help she needed. All three accessed family counselling through local charity Cause and Paulo also benefited from one to one counselling with the Public Initiative for Prevention of Suicide and Self Harm (PIPS). Two years ago he went on his first walk in the Mournes and found such a sense of peace and calm that he has been climbing every weekend ever since. 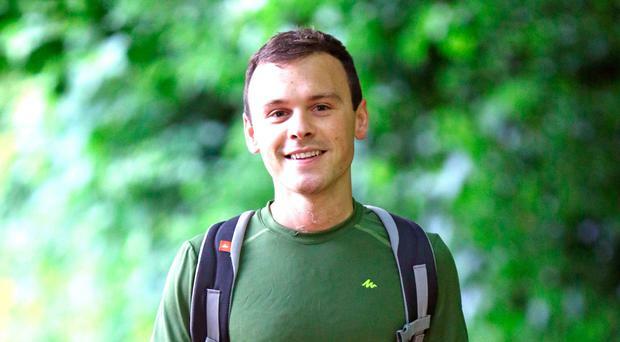 As the festival, which aims to encourage people to get out walking and discover the beauty of the Mournes, takes place later this month, Paulo has bravely talked about what it is like to watch a loved one live with mental ill-health. It was four years ago and out of the blue when his mum attempted to take her own life. Until that point she had hidden the anxiety which was building inside her. Paulo recalls: “Mum was always active and sporty, she played soccer and Gaelic football and was a referee and never really had any issues with mental health. “Just before she turned 50 it just came on to her all of a sudden — very, very suddenly, and she went drastically down with anxiety, low mood and she started self-harming. “It was tough to deal with and so unexpected. I got a call to say my mum is in hospital and had ­­taken an overdose. Life became a nightmare cycle of trips to the A&E and Paulo says there were literally hundreds of them over the next two years. Help was available but it was slow to come and it wasn’t until his mum suffered a psychotic episode that she was finally admitted to hospital and given the treatment she needed. Paulo describes it as her brain shutting down under the pressure so that she didn’t know who she was and wasn’t able to recognise her own family. He recalls the family’s frustration as they battled to get her the help she needed. “At first it was very difficult to get help,” he says. “The waiting list is so long for proper help that the illness ends up spiralling deeper and you have countless trips to A&E through self-harming. It is not until the 10th or 15th time you self-harm or take an overdose you get a bit of priority and it is taken seriously. “Help is there but just not quick enough for some people. You have to be very persistent with the health service. It is quite evident that they are stretched. The staff are excellent, really caring and understanding, but they can only work with what they have got. “The system isn’t perfect. There was a period of a psychotic episode when she went missing — she didn’t know her name, she didn’t know who she was or her date of birth and she didn’t recognise her family, it was very tough. “It was like the flick of a switch in her head, her brain just turned off and switched down which is why she qualified for inpatient care. “This was after about two years of self harming that she was admitted to an inpatient mental health facility. “She stayed there for three months two summers ago and she came out of there and finally got access to weekly psychotherapy. The therapy has made a huge difference to his mum’s health, but it is a long, slow process and her recovery is continuing even today. Paulo says: “It is life-changing for the person. It is very tough to rebuild your life again, it never really goes back to the way it was. Progress is there, and you just have to care for her but its hard. Paulo not only pushed for help for his mum but wisely sought support for himself. He benefited from a walk-in counselling service run by the charity PIPS in north Belfast where he had weekly counselling over two months. “It was literally to offload the stuff that was in my mind,” he says. “I didn’t want to bottle stuff up and I needed to talk about it to help me cope with everything that was going on. For Paulo it has been a life-changing experience. He says: “I changed my thoughts on life. I stopped worrying about little small problems. It puts life in perspective. “It is very emotionally draining but the way I see it is, some families are touched with cancer, some families are touched with heart conditions or premature baby deaths, and this is just the hand we were dealt. Another huge help for Paulo was discovering the joy of hill climbing and, in particular, in the Mournes. He says he stumbled across it by accident when a friend asked him to go up Slieve Donard two years ago and he was immediately hooked. He has now lost count of the number of times he has scaled all seven peaks and a typical weekend hike will involve climbing two or three in one day. He says: “I would always have been sporty and went to the gym and kept active so when a friend asked me to go up Slieve Donard I said yes. “It was amazing; it was the head space I needed. I was able to switch off and relax and get away from everything. “When you are hiking you are able to work out problems better inside your head. It lifts your mood and self esteem and it really helped me, it was an escape. “You feel great after doing it. And you don’t even have to hike, a simple walk helps. I find even a walk down the towpath clears my head. The three-day Mourne International Walking Festival, which has been going for 20 years, aims to encourage people to get their hiking books on and tackle one of the famous peaks. Paulo is delighted that his reputation as ‘Mourne Man’ on radio led to an invite to help promote the event this year. The award-winning Mourne International Walking Festival returns for three days, from June 22-24. This year’s special event will feature a range of routes suitable for those who are just starting out and those more experienced to walking a tougher terrain. Launched by Newry, Mourne and Down District Council, the annual festival welcomes hundreds of individual, group and family walkers of every age and all nine routes to choose from have been carefully planned to cater for both low and higher levels.